Top seed Novak Djokovic, opened his fourth-round match with a thrilling 16-14 first-set tiebreaker win over No. 22 seed, Alexandr Dolgopolov. Things got easier from there in a 7-6 (14), 6-4, 6-2 victory. The Serbian has been almost invincible this year when he survived a 30-point classic against Ukraine’s Alexandr Dolgopolov. Djokovic’s next opponent is his Davis Cup team mate Janko Tipsarevic, who beat former world number one Juan Carlos Ferrero of Spain 7-5 6-7 7-5 6-2 in a slugfest that lasted almost four hours. 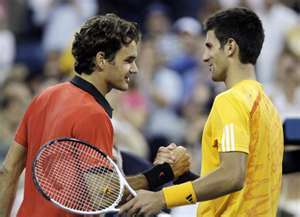 Third seed Roger Federer trounced with a brutal 6-1 6-2 6-0 win over Argentine Juan Monaco to reach the quarter-finals. Swiss eliminated his unseeded opponent in just 82 minutes under the Arthur Ashe Stadium court floodlights. The win, marked the Swiss master’s 30th successive trip to the quarter-finals of a grand slam event, dating back to the 2004 French Open. The 16-time major champion advanced to a clash against 11th seeded Frenchman Jo-Wilfried Tsonga, who rallied to overcome eight-seeded American Mardy Fish in five sets earlier in the day.